Which oils are right for your hair and scalp? Did you know that your hair strands have tiny shingle like ridges that act as the entry point for all products you use? In addition to this, your scalp, much like all your other skin, has pores which absorb the products you use as well. Many thicker oils, such as castor oil, have been claimed to “moisturize” hair. However, if the oil is too thick, it means it is made up of molecules that are much too large to actually penetrate the hair strand. 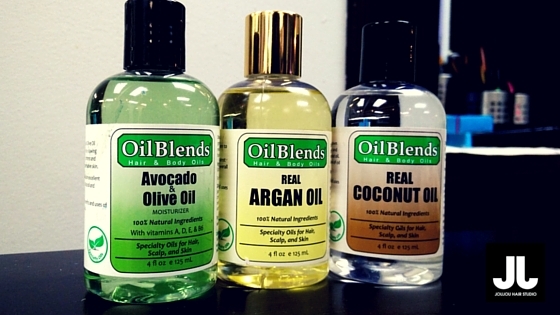 Therefore, these oils do not moisturize the hair at all, they simply coat the strand. A good trick to see if the oil you are using will moisturize the hair properly is to rub a small amount into your skin (on the back of your hand, for example). If the oil does not absorb fairly easily and leaves your skin feeling greasy or sticky, it will probably do the same for your hair. This list is by no means extensive, but they are some basics that tend to work well for quite a few of our clients. Be sure to use these oils in their liquid form only for best results and remember to always do what’s best for YOUR hair and scalp. Try your products out for 2-3 months to see how your hair responds before making a final judgment. Here’s to healthy, happy hair!